25 years of experiences from Zimmer developing the most advanced cooling technology. Zimmer Cyro 6 has zero consumables and is Industry gold standard cooling system. Buy a Zimmer Cyro 6 for laser tattoo removal Is the ultimate addition for proper treatment. Years of advancing the technology the Zimmer Cyro 6 will run all day long for treatments. Program different fan speeds and save Them to your liking. Glass Top Treatment Hose Length 6 ft.
A removable directional tip to control air flow. Utilize the detachable tip for precise cold air or remove the tip for large areas. The Zimmer Cyro 6 is a industry gold standard for topical cooling and pain relief during laser treatments. During cosmetic laser treatments there is the risk of thermal injury to the skin and the Zimmer Cyro 6 helps reduce pain and thermal injury by blowing continuous ice cold air. MedLaser USA makes purchasing a Cyro 6 an easy process ensuring a smooth installation and training process. Some laser devices have a cooling system built into the laser either with disposable air cans or a cold tip. Adding on a Cyro 6 by Zimmer is the ultimate addon for any clinic looking to maximize comfortability for their clients. Laser tattoo removal can be painful for some. Ways to reduce pain are limited to topical anesthetic or ice packs post treatment. When buying a Zimmer Cyro 6 as a addon to your laser tattoo removal procedure increases patient comfort and provides an environment which is the gold standard for tattoo removal. The device is easy to use with customizable settings for adjustable fan speed. When purchasing a Zimmer Cryo 6 you will have confidence knowing your client is comfortable. MedLaser USA is the #1 source for Zimmer Cryo 6 on behalf of Zimmer MedizinSystems. We offer competitive marketing pricing and shipping right to your clinic location. Having a warranty is important when purchasing any aesthetic medical equipment which ensures your purchase is protected. The Zimmer Cryo 6 system is a workhorse that is been designed to last with reliability. Warranties are included when buying a Zimmer Cryo 6 from MedLaser USA and are honored through Zimmer MedizinSystems. Purchase a Zimmer Cyro 6 from MedLaser USA with confidence. 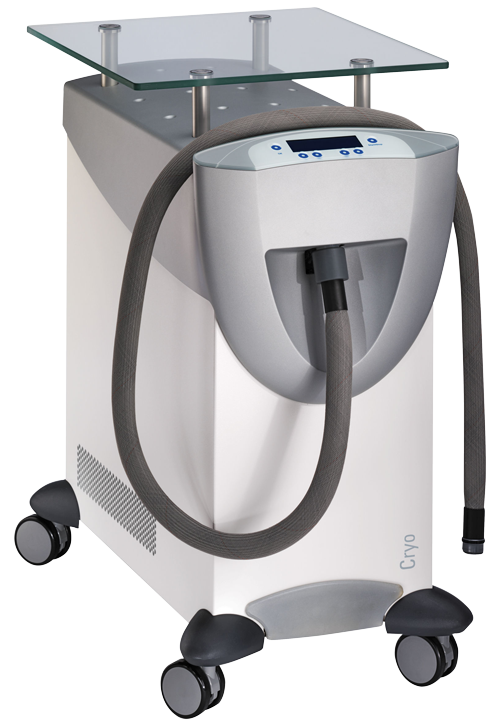 If you are researching ways to minimize pain for your clients the cyro 6 is the best addon piece a equipment you can buy for reducing pain during laser tattoo removal or any laser treatments which don’t call for increasing the temperature of the skin. The system produces freezing cold air reaching temperatures of (-30 degrees celsius). Confidently open your clinic doors knowing you have provided the best equipment and gold standard processes for maximum patient comfort. Some laser devices have the option to purchase disposable cryogen spray cans. Continuing to purchase cyrogen cans or cooling disposables like ice packs can add up and be extremely inconvenient. Eliminate disposable cooling costs when buying a Zimmer Cyro 6 from MedLaser USA. It is inconvenient to stock disposable cans for any laser device or running the risk of depleting your inventory in the middle of a laser procedure. Never experience running out of cooling disposables during a laser procedure again with continuous unlimited ice cold air for minimizing pain. Constant cold air will improve your clients experience with treatments such as laser tattoo removal and hair removal by minimizing pain. You are able to control the air flow with the removable focusing tip attached to the 6 feet of hose. By utilizing the focusing tip with the Zimmer Cryo 6 you’re able to target specific areas more precisely. Remove the focusing tip and you have the ability to flood a large treatment area with continuous cold air. Removing the focusing tip is perfect for large tattoo areas or utilizing it post treatment. The Cyro 6 by Zimmer is the perfect solution topical cooling and increasing patient comfort for all laser treatments that call for cooling. MedLaser USA is the #1 source for buying a Zimmer Cyro 6 and is also support with full warranties honored by Zimmer MedizinSystems. The device is easy to use and has the ability to run all day long for continuous treatments. The device is a must have piece of equipment for every office that owns lasers. The Zimmer Cyro 6 is truly an impressive system that is invaluable and worth every penny. The device is extremely easy to use and starts with a push of a button. Call MedLaser USA to purchase your Zimmer Cyro 6 today!